From the bestselling author of a scathing indictment of Clintonian foreign policy, Betrayal, comes an unbalanced but revealing expose on the mistakes, misdirections and blunders behind ""the most damaging intelligence failure since Pearl Harbor."" Gertz supports his argument that the intelligence community has ""lost sight of its purpose and function"" with interviews, news clips and almost 100 pages of government documents, some partially classified (a National Security Agency report reproduced within contains little but the date and the designation ""TOP SECRET UMBRA""-the rest is ""withheld at the request of U.S. intelligence officials""). He points a very stern finger at the FBI, the NSA and the CIA, ""where preservation of the agency's budget takes precedence over its performance."" 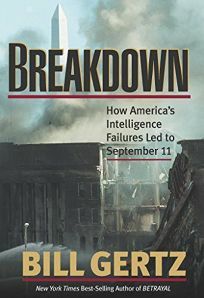 In one confounding case, Gertz writes, veteran CIA field agent Robert Baer was investigated and nearly prosecuted by the FBI for planning an assassination of Saddam Hussein; when the CIA discovered their jig was up, they left Baer out to dry. But while the insights into a government overrun by bureaucracy can be fascinating (and infuriating), Gertz seldom assigns any blame toward either George H.W. or George W. Bush's policies in the Middle East. He saves his condemnation, instead, for the Clinton administration (again). This one-sided portrayal may leave the critical reader feeling as if only half the story is being told, as Gertz's strong conservative bent distorts what could have been an important and well-informed look at the terrorist disaster.